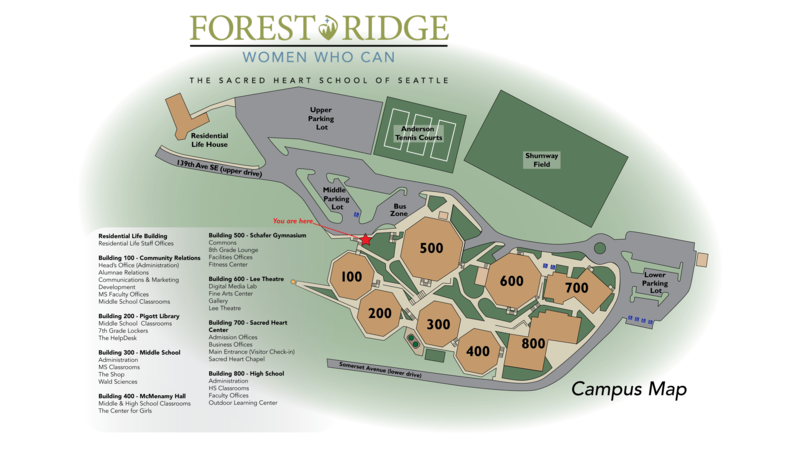 Forest Ridge of the Sacred Heart, a private school for girls in Western Washington, is easily accessible from the nearby areas of Newcastle, Medina, North Bend, Fall City, Redmond, Mercer Island, Issaquah, Renton, Snoqualmie, Seattle and beyond. Contact us to schedule a visit today! Take I-405 south. Take the Spokane exit onto I-90 east. Take exit 11-A, 150th Avenue S.E. Stay in the right lane and turn RIGHT onto 150th. Continue through the traffic light at S.E. 38th Street, stay in the right lane and continue up the hill. (The road becomes 148th Avenue S.E. and later Highland Drive.) Take a RIGHT on Somerset BOULEVARD S.E. Go past the Forest Ridge School street sign on 139th Avenue S.E. Take a LEFT on Somerset AVENUE S.E.. Continue on this road until you see the lower drive entrance to campus on your left. Visitor parking is located in front of the Sacred Heart Center. From Coal Creek Parkway turn NORTH onto Factoria Boulevard S.E.. At the next light take a RIGHT onto S.E. Newport Way. Follow this street up the hill until you reach the light at the entrance to Somerset. Take a RIGHT onto Somerset BOULEVARD and continue up the hill until you reach Somerset AVENUE S.E., and then take a RIGHT. Continue on this road until you see the lower drive entrance to campus on your left. Visitor parking is located in front of the Sacred Heart Center. Take I-90 west. Take exit 11 and stay in the right lane. Follow the signs for 161st Avenue S.E.. At the light turn RIGHT onto Eastgate Way. At the next intersection turn RIGHT on S.E. 35th Place, which becomes S.E. 37th Street. Turn LEFT at 150th Avenue S.E.. Continue through the traffic light at S.E. 38th Street, stay in the right lane and continue up the hill. (The road becomes 148th Avenue S.E. and later Highland Drive.) Take a RIGHT on Somerset BOULEVARD S.E.. Go past the Forest Ridge School street signon 139th Avenue S.E. Take a LEFT on Somerset AVENUE S.E.. Continue on this road until you see the lower drive entrance to campus on your left. Visitor parking is located in front of the Sacred Heart Center. Take I-405 north. Exit onto I-90 east. Take exit 11-A, 150th Avenue S.E. Stay in the right lane and turn RIGHT onto 150th. Continue through the traffic light at SE 38th Street, stay in the right lane and continue up the hill. (The road becomes 148th Avenue S.E. and later Highland Drive.) Take a RIGHT on Somerset BOULEVARD S.E.. Go past the Forest Ridge School street sign on 139th Avenue S.E. Take a LEFT on Somerset AVENUE S.E.. Continue on this road until you see the lower drive entrance to campus on your left. Visitor parking is located in front of the Sacred Heart Center. Take I-90 east toward Spokane. After the I-405 interchange take exit 11-A, 150th Avenue S.E. Stay in the right lane and turn RIGHT onto 150th. Continue through the traffic light at S.E. 38th Street, stay in the right lane and continue up the hill. (The road becomes 148th Avenue S.E. and later Highland Drive.) Take a RIGHT on Somerset BOULEVARD S.E.. Go past the Forest Ridge School street sign on 139th Avenue S.E. Take a LEFT on Somerset AVENUE S.E. Continue on this road until you see the lower drive entrance to campus on your left. Visitor parking is located in front of the Sacred Heart Center.